I have been so remiss in posting to my blog lately. I do apologize. We have had some structural issues going on in my Pittsburgh townhouse renovation. Everything is finally moving forward and I will post on the progress soon. In the mean time I have been busy baking at the beautiful Senti Restaurant and Wine Bar and decorating for clients in Pittsburgh and New York. It's a crazy life. Last month I was able to swing by Kips Bay Decorator Show House in NYC. 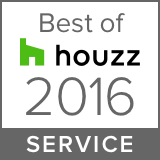 The nation's best interior designers participate in Kips Bay. There are tons of blog posts about the rooms. I want to focus on details. So here's a list of some great decorating details. Suzanne Kasler "sophisticated simplicity" sitting room used an upholstered a panel used as a decorative wall feature. Victoria Hagan's " American Dream" living room upholstered the sofa in two contrasting fabrics. Timothy Whealon's "white orchid room" was just lovely in every way. Soft window treatments and an inviting nest of a bed. A wonderful escape from a busy life! Searching for the perfect table that fit's my client's sensibility and space is a challenge that is really exciting. We, as designers, are thrilled when we find just the perfect item. It's something that is hard to explain, but it brings us so much joy! For one client, I needed a little table to sit between two transitional club chairs. There is a large minimal, yet strong painting behind the club chairs. I think I found it! As I was taking a picture, the designer of this table approached me. It was created by Barry Dixon. The gold ball comes out. He wants people to play with his pieces. He said you could put a birds nest in it, instead of the gold ball. So playful! Interestingly, this collection was inspired by medieval combat. So many of the pieces seem armored and sharp. Mixed with some rounded bulbous shapes. The sconce was inspired by a fencing mask. Mirrored dining chair with a storage unit that also serves as a platform for a piece of art. Lighting which includes sconces , Kelly Wearstler's "crystal" chandelier, simple table lamps. I am a sucker for simple lines that make a statement. See the guy above climbing up the scaffolding. Nice not to be so serious sometimes. Ok in the above pic, you need to ignore the accessories and upholstery and just look at the simple table. Also some decorating ideas in terms of window treatments and wall coverings. 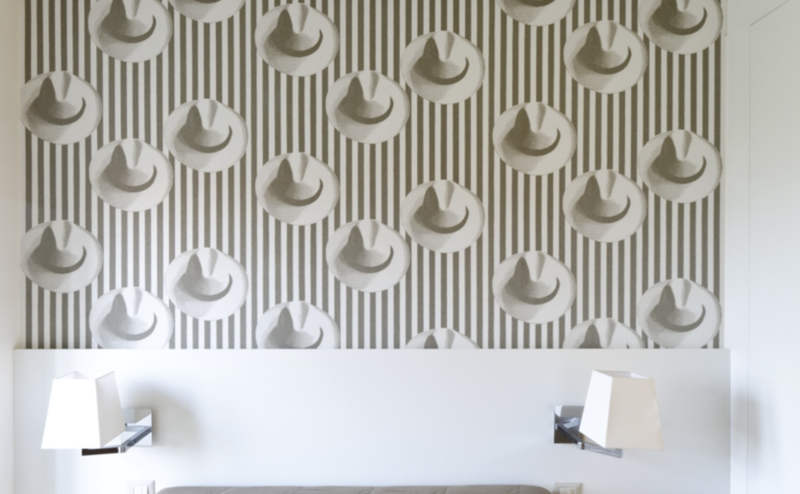 In the above pic, the showroom used tape and nail heads to create the design on the walls. I also liked this window treatment detail in this showroom. And I can't ignore the children's spaces, the beginning of the decorating journey of Cici Crib Interiors. The decorating look may just call for a modern rocking chair- I love this super cool leather one. And of course art work is just so important. I love these works for a baby's nursery or even a master bedroom. So peaceful. Too many digital clocks these days. Kids need to practice using analog clocks. Great for a playroom or boy's bedroom. Well that was just a sampling of what goes on at Market. Lots to bring back and decorate in New York and Pittsburgh! It is always a whirlwind going to Highpoint. One of my main goals is to see new merchandise and trends. Some trends are super obvious and some are my own gut feeling. Everyone was talking about color and exaggerated patterns. But how did that translate into rooms? It seemed like there were two different kinds. Splashy and serious. Rooms seemed to be either male or female. How odd. Rooms for ladies- decorating was glamorous . Gentlemens' rooms were tailored and serious. Both were bold and dramatic. The monotone, gray, unisex was gone. So if you are thinking about decorating your master bedroom into a luxurious, dramatic oasis or your bachelor pad and would like it to be an classic and tailored, there are many decorating ideas to behold..
April is the time when new fabrics are rolled out by the most discerning fabric houses. 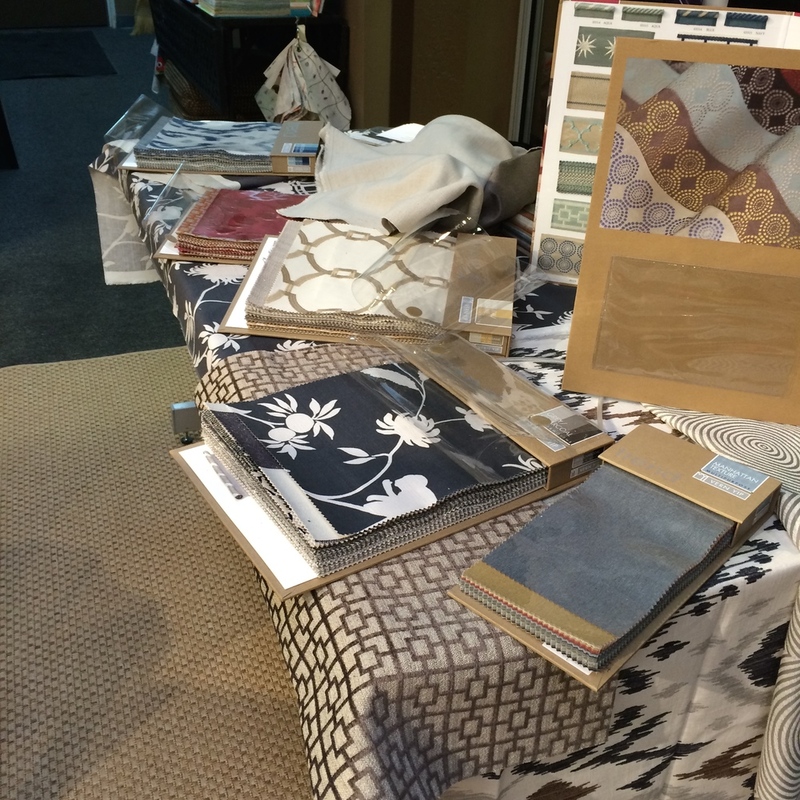 Interior designers were invited to Design Trade in the Strip District to preview the new collections. It was a festive and inspiring time! My favorites were from opposite ends of the decorating scale. Classic and clean versus edgy and quirky. Thibaut showed some crisp traditional fabrics with a twist. By the way, we were so inspired by the butterfly paper above we decided to use it in a little girl's bedroom as an accent wall. My other favorite from the Spring Market preview was a French company, Élitis. Sometimes highly textured, sometimes three dimensional, and sometimes completely out of scale. Just fantastic. 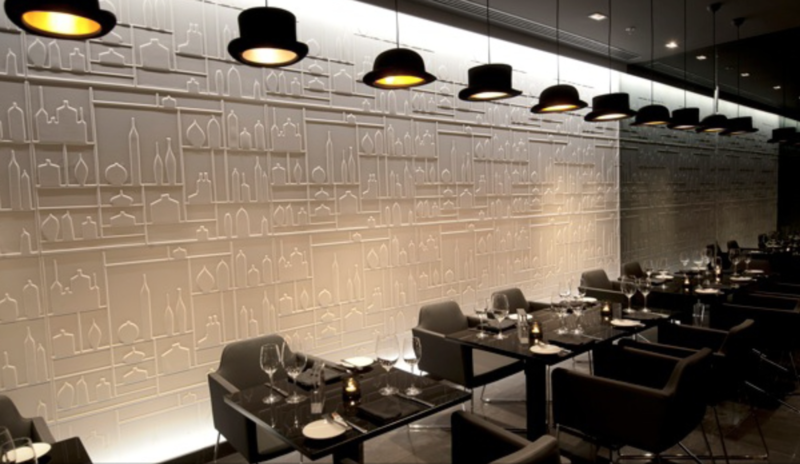 Their coverings work in both both comercial as well a residential environments. 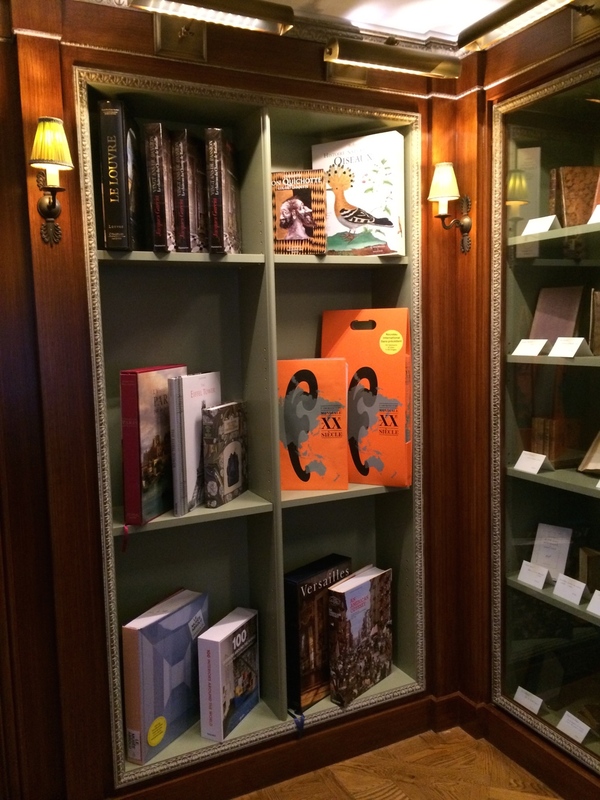 I got a chance to stop into Albertine book shop a few weeks ago in NYC. Located in a Fifth Avenue mansion owned by the French Embassy, I quietly say it was it's interior design that drew me to visit the shop. 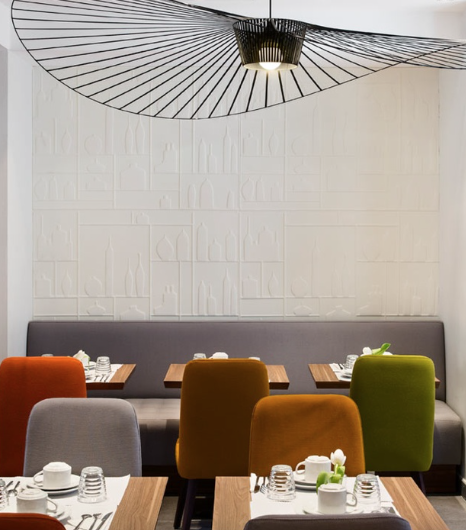 The space was designed by Jacques Garcia. He totally respects all aspects of traditional French design. But he also adds colors and twists that make the space fresh and unique. Garcia designed a furniture line for Baker which is in that same quirky traditional vein. There is crazy inspiration for a home library or office in the bookshop. The celestial ceiling, the green interior of the bookshelves, the trim on the bookshelves, the simple step stool, the eclectic mix of modern and traditional furniture. And how can anyone not notice those out of proportion, gorgeous light fixtures. So enormous. It's always great being in NYC. Now I notice it more than ever after moving to Pittsburgh. So I am back in NY visiting with clients, sourcing new fabrics and furniture and visiting with friends. 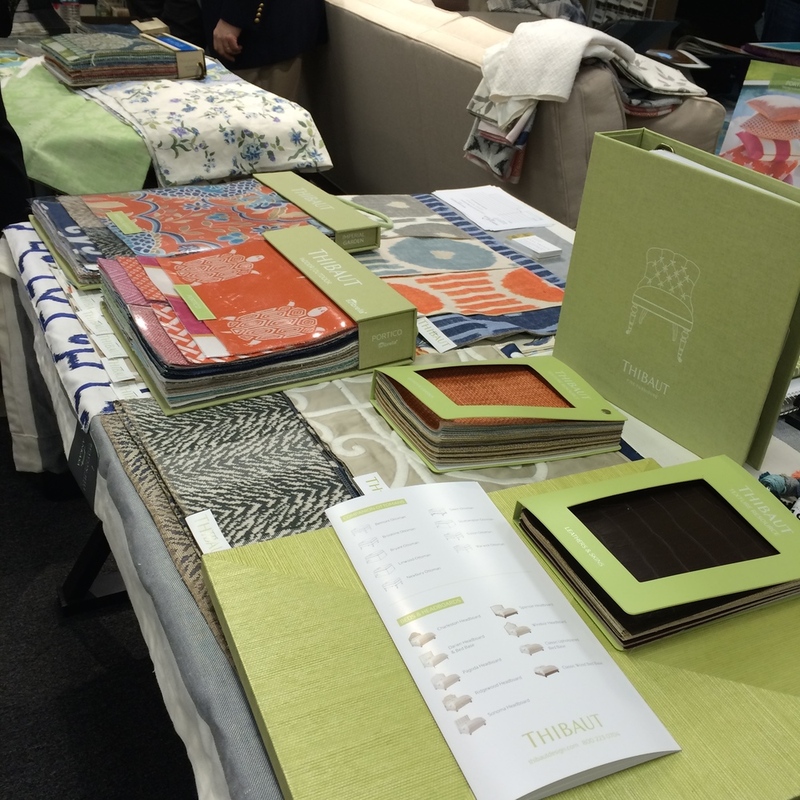 It was a whirlwind that ended at the NYNOW show. The day was cold and snowy. Definitely reflected my decorating mood. While everyone was talking about color, I noticed all the soft colors and sparkly accessories. Monochrome colors in Art . Decorating for several spaces- A quiet physician's office, a young hip couple who embraces Andy Warhol's birth place of Pittsburgh, to a a classic mom's NYC master bedroom. I'm always on the look out for what's new in baby nurseries. Great crib and a funky big sister's chair. I would love these dishes for my new place in Pittsburgh. Last stop was this Japanese vendor who has the most delicate little loves. A mobile of sorts. Time to fly home.. 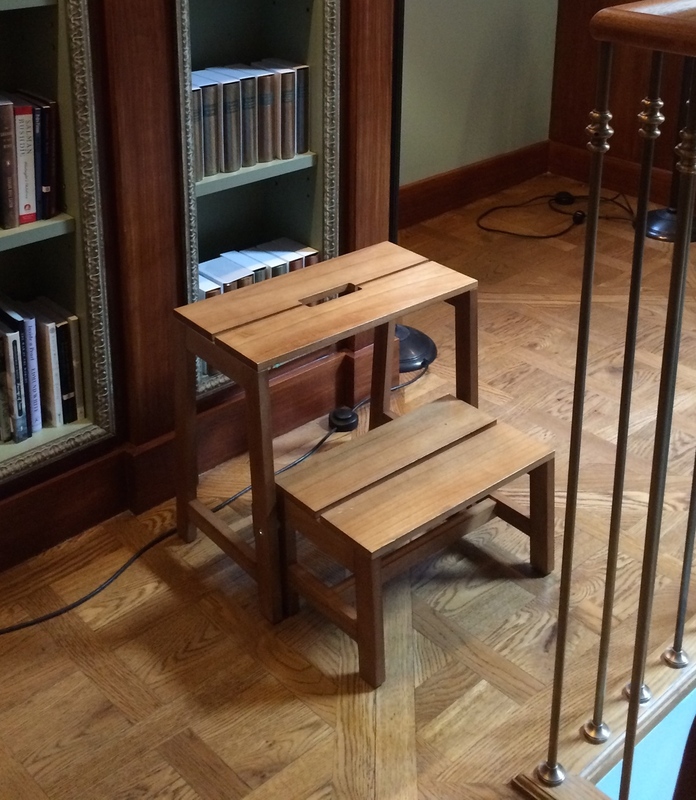 I was able to see the Beatrix Potter Exhibit at the Morgan Library last weekend. A very nice respite from all the chaotic crowds of the city. Most of her book ideas came from stories that she wrote to the children of her governess. Her gentle and delicate drawings were full of imagination. The exhibit is so worthwhile- there is also a spattering of toys and other items related to Beatrix Potter. Lots of decorating ideas for boys and girls rooms down in Highpoint. Most of my vendors aren't necessarily focused on children. It doesn't really matter as long as the design is cool and the furniture is relatively sturdy. For a very little boy who is a little gentleman, this dresser is lacqured and lined with linen. The knobs are a play on the US coat of arms. Simple, modern bookshelf that is actually well made and not Ikea. Great kids storage. Always interesting art for kids rooms. Love these vintage photos for a boy's bedroom..
Hand painted animals done on book covers. Nice art for baby's nursery. Great fashion photos for an Audrey Hepburn inspired tween bedroom. They come in really large sizes as well. This lamp is just right for a little girl's room that I am working on now. This lamp will go into a transitional boy's bedroom inspired by everything nautical. We ended our day at a children's furniture vendor that carried little beds for dolls as well. They made special doll bedding as part of the display for market. Oh so cute and inviting. Just got back from Highpoint with loads of ideas. What I noticed most about the vignettes created by vendors was the use of color. Whether it is a traditional room, casual room, kids room or adult- all I saw was ORANGE! We started out our day at a seminar on trends. One interesting concept was proportion and scale. By the end of next year we will see more oddly, but interesting plays on the sizing of furniture and accessories. I just love this look. We started seeing it at market this fall. Notice the huge urn on the small sidetable. The floor lamp with the jolly green giant's shade and skinny base sits next to a standard size sofa. The paisley print is enormous on this 6'x9' rug. The tassle on steriods hanging from light fixture. This market wicker and natural fibers are making a comeback in furniture. What great fun! If you are interested in purchasing any of these great new items, shoot me an email! This weekend a walking tour of artist's studios and galleries is being organized by Casa Frela Gallery. A very inspiring artist, Fumiko Toda is one of the eighty artists participating in this weekend's walk. A client and I visited her tiny studio in a typical Harlem brownstone this year. Though very small, Fumiko keeps her space very well organized and welcoming. Her work is intricate with subtle layers of color and delicate details. Her fascination with insects, evident throughout her work, began as a child in Japan. Fumiko is as whimsical as her work, lovely and waif-like, she is happiest in her studio. If you have a chance check out the art walk! My go to place to shop for baby gifts and decor is the New York International Gift Fair. The summer fair is far more laid back. New products are less common, as vendors are gearing up for 2013 launches. As I become more of a veteran to this show, vendors will ask my opinion on new products they want to launch for the upcoming year. It's always a lively discussion. From fashion trends to industry practices, nursery decor changes constantly. I was a definite go on this new 2013 artwork..
Color is always big at the show..
Great chevron chair for a girl's bedroom! Some more art that will be coming into the shop in the coming weeks. I purchased this piece because it reminds me of a client whose nursery we are working on in NYC. I loved this little piece as well.. I love the booth of Kevin Obrien. His throws and pillows are so luxurious and special. From the remnants, he hand makes these special stuffed animals. A visit with very busy mice..
My day ended sitting on these tree stumps. Made in Italy, each are crocheted. Very comfortable. Could be a great footstool or ottoman in a baby's nursery. Yes they will be coming into Cici Crib! I look back on some pics that really are just nice little moments of our time in London and Dublin. A gardener at Windsor Castle. A royal kitty at Kensington Palace. A tennis party in Chelsea..
A tunnel where graffiti is allowed! The images change by the day. Love the turnip and apple soup..
A theater entrance in Chelsea. The shop where Harry Potter bought first wand..
Best coffee on our entire trip was at Butlers Chocolate Cafe in Dublin. After spending days in London, our trip concluded with some quiet time spent in Dublin. Yes it was very cold and rainy. One morning in the hotel, we were unsure of our plan to take a drive through the countryside because of the dreary weather. An Irish woman overheard our dilemma. She told me that we must go. "The countryside is more beautiful in the rain. You can smell the grass!" Oh so true were her words. Just spectacular! It was so cold we purchased and wore Irish sweaters. One company that made the most happy woolens was Avoca. Their baby blankets and throws were just so lovely. I wish I could carry some at Cici Crib. We visited the mill in County Wicklow, as well as their main shop in Dublin. On Saturday we decided to check out London's East End. A stark contrast to our hotel's location in South Kensington, the area surrounding Brick Lane felt alive with funky, cool shops, art galleries, delicious smells of spices, and a morning flea market. How can you beat that?? We enjoyed the show of Consuelo Radclyffe going at the Espacio Gallery. The work below is entitled "What Have We Done?" I purchased my memento from London at Station Comfort, a flagship boutique featuring the designs of Amy Anderson. Her jewelry is displayed so beautifully. We ended the afternoon at a flea market. James finally found his London memento at the market. Since we arrived he was debating what he wanted to bring home with him. He is not a T-shirt kind of kid. We found it at a stall selling old police whistles. We purchased a whistle stamped London that dated from the 1930's. He wants to make it into a key chain. Going to Europe with two teenage boys, leaves little time to check out baby decor shops. I focused on one area in Chelsea and found 3 shops that really had similar sensibilities. They reminded me a little of the Cici Crib that I first opened. Focused on baby, sweet, soft and very child like in a good way. Much of my shop changes with people's tastes and needs. Longevity, budget and contemporary tastes have changed our vision of a nursery. I like the change, but when I visit these shops there is a very comfortable feeling that reminds me of my childhood. The first shop I visited was Blue Almonds. I loved the entrance floor mat. Maybe I should do something like this at Cici Crib. Notice how the bumpers go half way around the crib. They had many products from a Spanish Co. called Pasito a Pasito. Unfortunately, they don't import to the US. A shop almost next door was called Nursery Window. It has been opened for 15 years. They carry signature prints for both clothing and decorating. In recent years, the baby clothing segment has shown the most growth. Notice the slip covered counter. The last shop I visited was right down the street, called Dragons of Walton Street. Their specialty is hand painted furniture and accessories for both baby's nursery as well as children's rooms. I really like the English interpretation of mixing modern with traditional. Like their architecture, there is always something to ground us in the traditional elements. The Shard is London's newest building. Really quite cool. At first glance it seemed like it wasn't completed. I told my son it looked like a shard of glass. Later to find out- it's given name. I visited the William Yeoward shop. Unfortunately, like most London shops, they politely requested me not to take photos. Such a shame. So much inspiration. I still got a few in before the the camera case was closed. Not modern, but certainly not 100% traditional. Notice the trims and patterns. The details are so thoughtfully executed. Just pure cool British style. We went for High Tea at the Athenaeum Hotel. Named best afternoon tea in 2012 by the UK Tea Council, it was definitely one of our favorite memories. So completely elegant. Again notice the finishing touches. The trims, the welting, the buttons.. Oh and the handsome boys.. Yes, I can see why the weather would get you down. Enter the Designer's Guild for perking up your mood.. They were having a fantastic summer sale! Next up the baby shops..
London was just fantastic. Sparkling from the Queen's Jubilee and ready for the Olympics, London is showing off it's incredible beauty. The weather was mixed, but preferable to New York's crazy heat wave. Before it is too late, I want to start with Wimbledon. You may not know that I am a crazy tennis fan and an always improving rec player. I watch tennis on my beloved tennis channel year round. I was chatting with a customer this Spring about my upcoming trip. He was kind enough to arrange for me to see the women's quarter finals and get an invitation to the Member's Club at Wimbledon. What an experience. It is so different from the US Open. The Open is a super charged sporting event! Wimbledon is an exclusive country club that that puts on a very special tournament every year. Everthing is just so thoughtfully laid out. The Wimbledon train station platform has been transformed into a tennis court. The ticket and daily info is just perfectly designed.. The entrance to the Member's Club which eventually leads to center court. We always see the players come down these steps after they won. There are portraits of every winner since 1877. A photo of last year's winners hangs in the lobby. Purple and green are the colors of Wimbledon, from the small floral arrangements in the club to the beautiful hanging baskets that sprinkle the grounds..
Did you know the net posts are wooden? Chic leather Wilson bags introduced at the tournament. And we can't forget the strawberries and cream. Notice the nice napkin.. It was all so pleasant and lovely. But I can't wait for the US Open. High up on Arthur Ashe, where the sun beats down and the sky is open, slathered in SPF 100 sunscreen and slurping a frozen lemonade! A very lovely customer sent me this link of Princess Beatrice giving a tour of the playhouse. It is every little girl's dream. How lucky! Drizzle, cloudy and damp. This is what we are expecting for our upcoming trip to the UK. Cozy boys bedrooms in Tudor houses is what I always imagine to be in Britain. Birth place of punk. You can always expect the funky in decorating. Love these childrens fabrics by Jennie Maizels! The union jack is always a popular motif in decorating boys bedrooms.